A course of CDT could run for between 5 to 20 (or more) consecutive days. During CDT, it is necessary that patients wear loose fitting clothing to accommodate our multi-layered compression bandages. 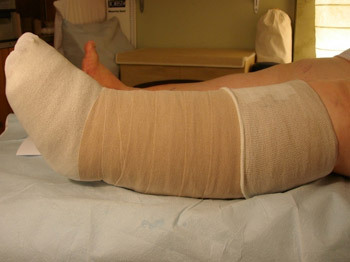 Bandages will remain on the treated limb for approximately 22 hours each day during the entire course of CDT, only being removed during treatment. Most patients are able to function unimpeded during this time, with only minor restrictions. Although a time intensive process, CDT is the primary means by which this type of result can be achieved.